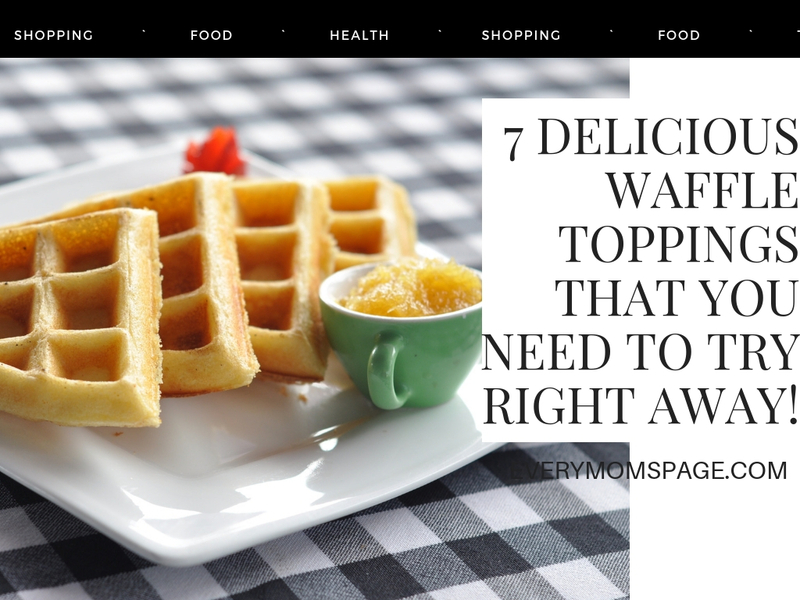 EveryMom'sPage: 7 Delicious Waffle Toppings That You Need to Try Right Away! 7 Delicious Waffle Toppings That You Need to Try Right Away! Every mom knows how thin waffle maker can jump in to help when there are no good ideas about what to prepare for breakfast. But, undoubtedly every waffle is far better when it has some delicious topping to make it even yummier. For instance, some chocolate and fruit can be a perfect match at any time but why not try some unusual ideas and maybe fall in love with them forever! Not so unusual combination but very easy to prepare. All you need to have is 2 sliced apples, unsalted butter, maple syrup and 1 teaspoon of cinnamon to the pan and your waffle will taste and smell perfectly! Take two waffles on a baking sheet then stretch a large dollop of lemon curd over each waffle and top each with a handful of chopped marshmallows in an even layer. Then pan them under a hot grill for a couple of minutes until the marshmallows are toasted and gummy. Put another waffle on top of each lemon glaze and cut into slices for a new favorite breakfast snack! Bring the cream to a boiling point then remove it from the heat and add the chocolate. Let stand for a couple of minutes, then mix until the chocolate is melted completely so it can spread nicely all over the waffle. Add the confectioners' sugar and whisk until its creamy. All it takes to try this topping is to add one or two tablespoons of peanut butter and a half of banana sliced on top. Additionally, you can add melted chocolate or some other syrup to make it even sweeter if the peanut butter and banana topping isn't sweet enough for you already. No. Your waffle doesn't have to be sweet every time you make it and there is no reason not to experiment with some salty tastes. Save some of the onions that were made for french onion soup for example and try them on a waffle! Melt some cheese on top to match the perfect and tasteful combination. Make one hard-boiled egg then slice it into pieces to spread it all over the waffle nicely then add some spinach or watercress to make it even more healthy. Additionally, you can and a little bit of mayonnaise just to make the taste even more delightful. We can call this one also a "Caloric bomb". If you are in a need of big energy storage for the rest of the day then this addition to your waffle can be a perfect choice. Simply add a layer of turkey and layer cheese and place under the broiler or into the waffle maker until the cheese is melted. The great thing about legendary waffle is how well it can be combined with nearly everything that you can find in your fridge or kitchen in general. There is no reason not to experiment every morning while preparing breakfast and these ideas are just some of the many that you can try that your kids would love to eat.